What is Logical Pro X? Logic Pro X is an excellent and demanding software for digital audio workstation and MIDI sequencer with 3D sound quality. This software application is designed for Mac OS X platform. Logic Pro was originally designed by German software developer C-Lab and later on Emagic incorporated its user functionality. After passing some time, Logic Pro became the part of Apple product when Emagic was acquired in 2002. Pro X is the most updated and advanced version of audio workstation and 3D sound system. It is a complete professional recording studio for audio and music with simulation capabilities to drive the best results. Logic Pro X includes everything that go from first inspiration to final master record. This software consists of wide range of audio tools and sound systems through which fine-tuning of recording, vocals and sounds can be made quickly. The user interface is designed elegantly with one-window interface of multitasking such editing, file browsing, toolbars management, sound controlling and digital recording system. Skills and expertise of using Logic Pro X with comprehensive command over user interface requires you to join certification program of Brainmeasures. This is a versatile certification program that is especially designed to cater the needs of audio workstation working, digital audio recording, audio mixing as well as MIDI use with voice mixing. Logic Pro X is an online certification course of Brainmeasures which will enable you to become excellent and master to control multi-dimensional tasks of audio and sounds recording and mixing at Apple platform. Aside from the course syllabus and different audio and sounds recording techniques, an online exam is also the part of this course to assess the knowledge and skills that you will gain during the certification program of Logic Pro X course from Brainmeasures. After successful completion of the course, candidates will be awarded with the prestigious Logic Pro X certificate from Brainmeasures to admire their knowledge and skills that they will enhance during the course. Ultimately, this certificate will be an added point of skills in your Resume that will lead to increase your earnings or getting better employment opportunities. 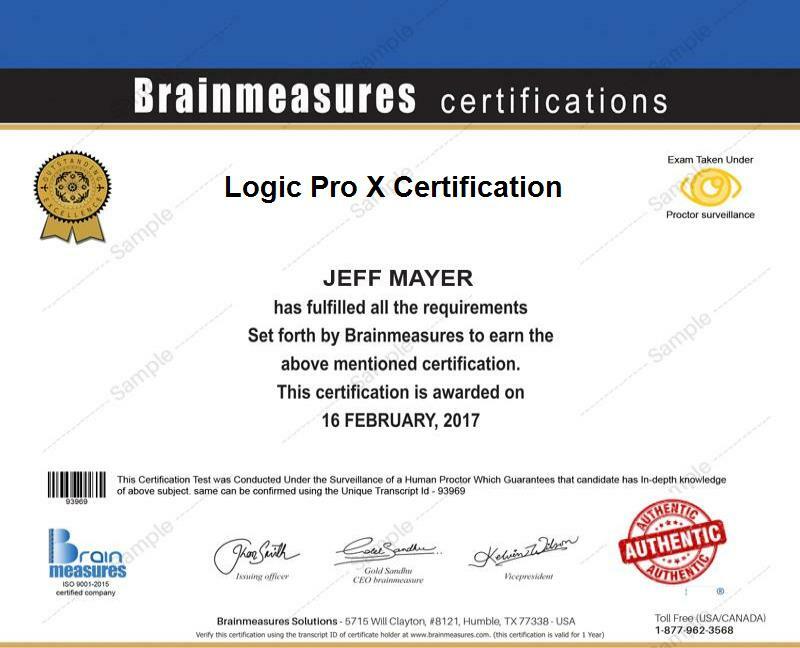 By getting the certification of Logic Pro X from Brainmeasures is not only guarantees you about your knowledge and expertise in working environment of audio workstation but it also translates in improvements in earnings and salary levels with better working environment and advanced audio/sound systems. The average annual salary is $85,000-$105,000 per year and this amount may vary significantly based on the reputation of Logic Pro X in the audio and sound mixing industry, nature and reputation of the organization, skills and experience of the candidate etc. No doubt Logic Pro X certification is important not only for those who are working audio and sound system recorders, studio editors, audio editors, sound mixers, audio mixers, digital audio and sound designers, MIDI mixers, track recorders, song recorders it is equally important for students, teachers and musicians as well. This certificate is designed for all those people who are providing their services at different positions in audio, sounds, and music and film industries.